The steam generator is wood fired and has a far greater capacity than needed. Fuel used is waste timber from local sawmills (8×5 box trailer load / season). Our still uses steam distillation with saturated steam at the ambient air pressure. 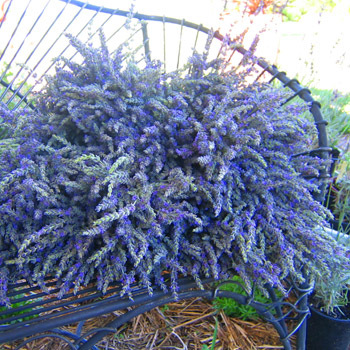 Volume of basket = approx 150l and this equates to about 35 to 40 Kg of lavender plant material when well packed. The “basket” has solid walls of stainless steel and a mesh floor also of stainless steel. It has a sealing ring around the top and rests on this ring inside the 200 litre still pot. Steam is introduced into the area just under the sealing ring and is then forced down the outside of the basket, through the mesh floor and then up through the plant material. Because the outside of the basket is heated first there is little or no reflux within the basket to come into contact with plant material. The condenser is approx 1100mm long and 100mm in diameter. It has 12 x 12mm stainless pipes inside. We run the condenser as cold as possible. The original condenser design had only 7 x 12 mm pipes and we found that if the fire was to hot and producing lots of steam the condenser overloaded and allowed vapor to escape. Typical distillation time is 20 – 25 minutes, however we plan to experiment with longer distillation times for our own interest. Oil hydrosol ratio varies depending on cultivar and how large the fire is in the steam generator.